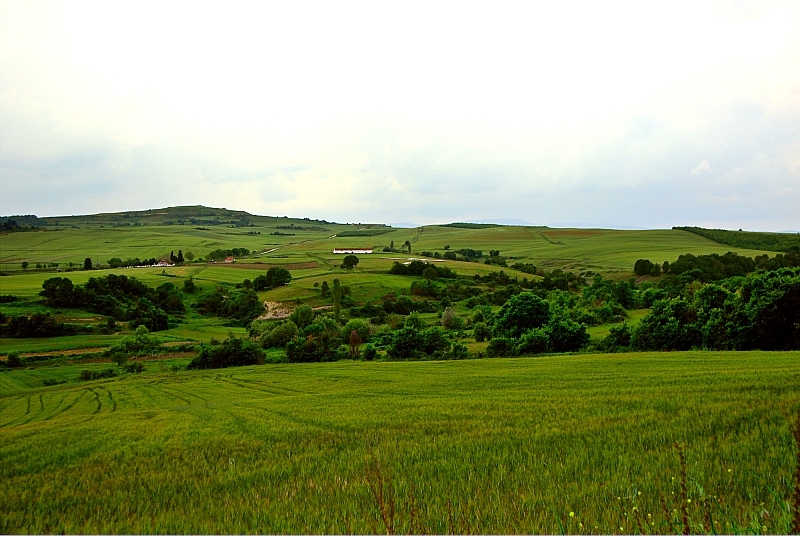 The Neolithic site of Avgi is located on a hilly terrain (c. 740 m a.s.l.) of clay rich deposits at Kastoria region, northwestern Greece, very close to the modern village of Avgi (0,5 km) and close to the modern town of Argos Orestiko (7 km to the East) as well as Lake Orestis (c. 10 km to the Northeast). 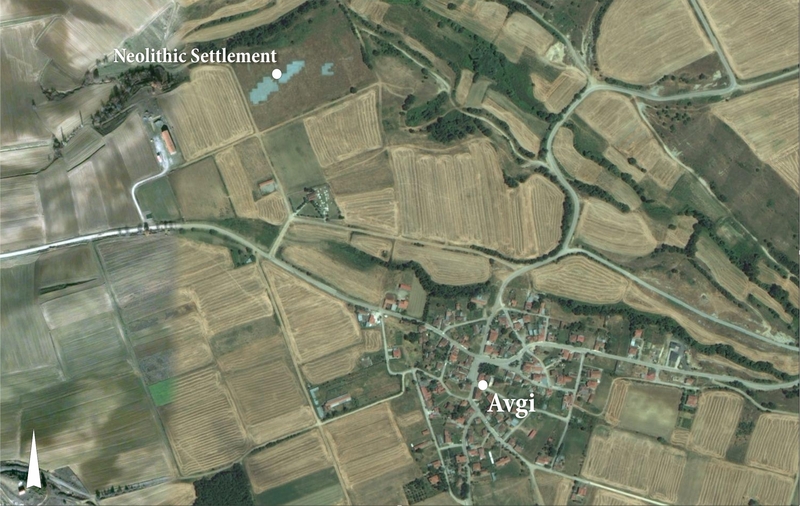 The modern village of Avgi and the Neolithic Settlement. The settlement rests on the gentle slopes of a wide terrace, flanked by a Pleistocene-Early Holocene stream at its northern part. The southern part of this terrace, along with the archaeological deposits, was totally eroded after the Early Byzantine Period by a stream. The site and its surroundings (view from the East). The site forms an ‘extended’ settlement, a well-known type in the Balkan Neolithic and now widely recognized in the Neolithic of Northern Greece. The known extent of the site is about 5 ha of which c. 2,000 m2 were investigated during the excavations carried out from 2002 to 2008 by the former Hellenic Ministry of Culture (now Hellenic Ministry of Education and Religious Affairs, Culture and Sport), in particular the 17th Ephorate of Prehistoric and Classical Antiquities under the direction of Dr. Georgia Stratouli. 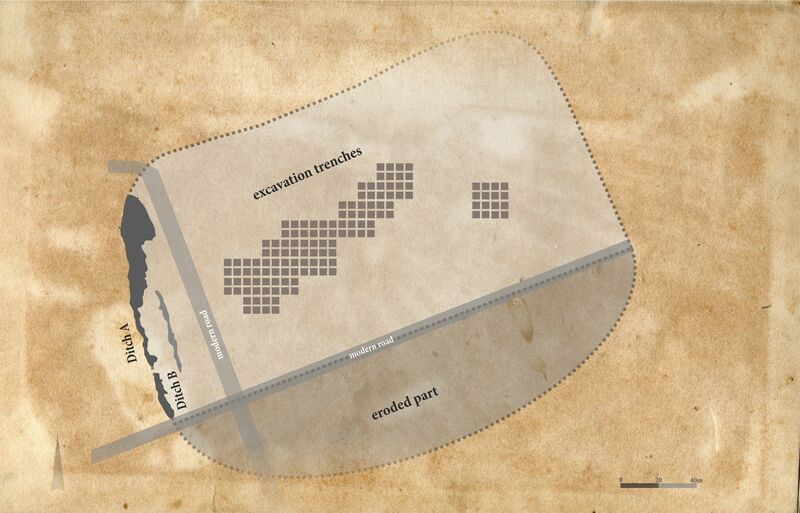 Plan of the site, the excavation trenches, the eroded part and the ditches. Based on radiocarbon dating the Neolithic settlement dates to the Middle Neolithic (c. 5700-5300 cal BC) and the Late Neolithic I and II (c. 5300-4500/4300 cal BC).The earliest use of the site dates to c. 5650 cal BC. According to the geophysical survey, later confirmed by a trial trench, the western boundary of the settlement was defined by a system of two ditches. The westernmost Ditch A was U-shaped in profile, more than 5,80 m. in width and more than 2,15 m. in depth. The second feature, Ditch B, is a double ditch, comprising of two crosscutting profiles; the westernmost was c. 1,20 m. wide and 1,00 m. in depth, while the easternmost 1,40 m. in width and 1,20 m. in depth. The profiles of Ditches A (upper) and B. The Neolithic ecosystem of the site included mountainous and semi-mountainous regions as well as river valleys. The environment favored farming, i.e. cultivation of cereals and pulses, such as wheat and lentils, as the archaeobotanical study indicates, and grazing of domesticated animals, such as sheep, goats, pigs and cattle, all well documented in the zooarchaeological assemblage. Panoramic view of the site and the surrounding area. It also supported hunting and fishing as well as the collection of fruits, and a range of raw materials used in the construction of buildings and related features, the manufacture of tools, vessels and several other objects. Husbandry activities in the periphery of the site. 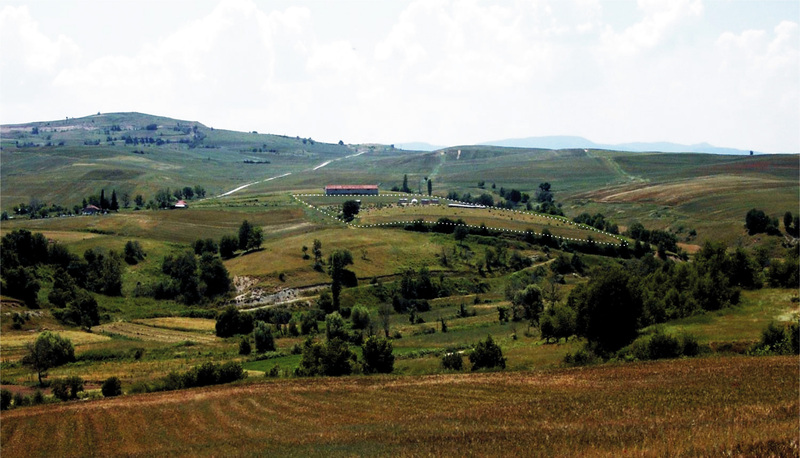 In contrast to the modern landscape of Avgi, which is characterized by extensive land use with farming as the basic means of livelihood, the Neolithic landscape was radically different, being covered by forests. These provided according to the anthracological analysis the raw material for the post framed buildings along with firewood, edible fruits, or even animal fodder. Another view of the site during spring.